Buy through MusicWeb for £14.00/15.50 postage paid World-wide. This is the first volume in a new series devoted to historic recordings by Norwegian artists. In the case of volume one �historic� stretches back as far as 1946 and as far forward as 1973. The parameters are set at 1945 to 2000 so we can expect a wide range of material, ranging I suppose from acetate to digital, though being curious I searched but failed to find enticing details of subsequent volumes. The musicians include a violinist, a singer, a pianist, organist and a flautist. Their careers were variable, some having international reputations, some ploughing a more native soil. Violinist Ernst Glaser was born in Hamburg in 1904 and studied with Flesch for four years. He took up a position as leader of the Oslo Philharmonic in 1928, a seat he was to occupy for fully forty years, less the war years when he had to leave Norway for obvious reasons. He premiered concertos by Kielland, Egge and Arnestad and was an admired teacher. These are the earliest recordings in volume one, made in 1946 with his wife as accompanist. It was clearly a dance-themed recital of six short pieces, preserved in the NRK Archives. Glaser was rather a charming player, small scaled and with the typical rhythmic surety of an orchestral leader. The ethos is old fashioned, sparing of vibrato, sometimes unvarnished and exposed and flirting dangerously with intonation. Portamenti are quick but pervasive and the vibrato when extensively used rather slow. Unusually he plays the Elgar Serenade, originally written for piano. This is not acknowledged in the booklet but is actually the Szigeti arrangement - so perhaps Glaser had heard Szigeti�s 1934 Columbia recording of it. Glaser died in 1979. Mezzo Marit Isene had a wider career. Born in 1923 she sang early in Stockholm and Oslo, then Zurich. She later sang under Solti in Frankfurt and Sieglinde and Gutrune in Wagner performances with Knappertsbusch in Paris. It was Flagstad herself who invited Isene to return to sing at the Oslo opera, which she did until 1973 after which she taught. She retired at seventy and died at eighty and the notes tell us that she compiled a documentary archive of her career and personally considered the recordings here representative. They show her voice as strong and expressive, albeit with a rather florid portamento in the Strauss St�ndchen. The Wagner is a sliver of a memento of her performances of the composer, and in rather occluded sound as well. Her Verdi comes from 1965 and shows the voice is commanding but has deepened and hardened, and is less mobile, though she was only forty-two at the time. Organist Arild Sandvold (1895-1984) is the elder statesman of the quintet of featured musicians. He�d studied in Oslo and with Karl Straube in Leipzig. Cathedral organist in Oslo for over thirty years he was a choral director and teacher. I�m not aware how many recordings he may have made, if any, but fortunately broadcast performances have been preserved. He plays a work by Ludvig Mathias Lindeman, a predecessor of his at Oslo, and does so with imagination and romantic sweep. Registrations are apposite, colour is warm, and there�s a sense of spacious nobility allied to a fine declamatory peroration. 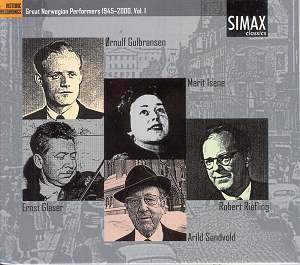 Born in 1917 flautist �rnulf Gulbransen died in 2004. One more Oslo associations are strong and long lasting. He was a member of the Philharmonic for thirty years, at a time when Glaser led the orchestra, and he toured internationally. He taught widely, and that included a six year period in Vermont, spending time working with Casals and Serkin, and also in Canada. He was a highly admired soloist and chamber player and a clearly demanding teacher. He plays the concerto by Johan Kvandal as preserved in a 1966 performance. This is a sprightly neo-classical work, spongy and pert, strongly Stravinskian with quite an intense slow movement. Flecks of Shostakovich are there; maybe a nod to Hindemith. Which makes it seem far less spirited and enjoyable than it actually is; Gulbransen plays with great verve and sensitivity. Maybe the best known of the quintet of musicians is Robert Riefling (1911-1988). He studied in Oslo and made his professional debut at fourteen before studies with Karl Leimer, Kempff and Fischer. He was apparently the first Norwegian pianist to play the �48� in concert, recording it twice. He was also a proponent of concertos by Egge, S�verud, Rivertz and Valen. His career was distinguished and his teaching life equally so. Given the foregoing it�s no surprise that we hear him in Bach. He plays the Chromatic Fantasia and Fugue in D Minor with limpid and rounded tone that reminds one in particular of his tutelage with Kempff. Tone colours and clarity are subsumed to a warmly romanticised reading; the conception is entirely pianistic, the execution first class, the tempi not pressing but singing and under perfect digital command. Maybe his Sicilienne is over accented in the left hand but Riefling always leaves a strong impression in Bach. So that�s volume one. The sound quality is never less than good, even in the case of the 1946 broadcast. Notes are apposite and the mini biographies are useful for school and graduate entry levels. Each musician has a photograph as well. I can imagine pedants complaining about miscellaneous programming but so far as I�m concerned this is fine reclamation work by Simax. These are musicians we should hear. And let�s hear more of them and the others to come in this valuable series.